In Vitra is a(n alleged) JRPG developed by bumblebee. (sic) and published by rokapublish GmbH (sic). In Vitra succeeds in managing to not improve the genre or stand out. Saying this title is a cliche is an understatement. Poor writing, a bland story, and a turn-based battle system, which was more fully refined in the original Dragon Quest,hinder anyone’s enjoyable of this title. 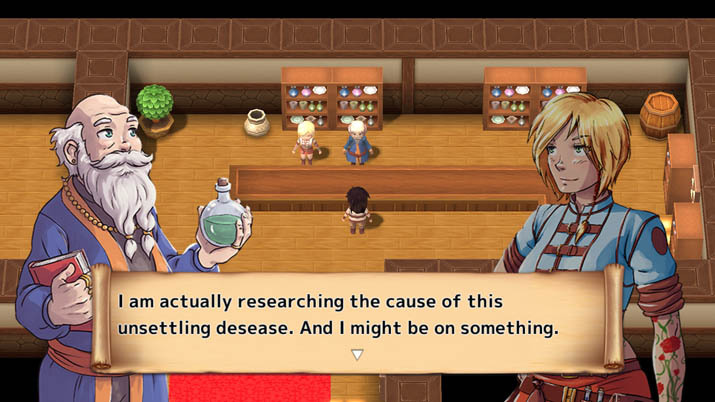 The story revolves around an epidemic spreading through the country of Vitra, which motivates our heroes, Noa and Luke, to embark on an adventure to obtain a cure for his grandmother’s disease. Later, you encounter Lee-Belle and Billa, which completes your party of four, each character joining for his or her particular purposes. The complete cast, however, are one-dimensional personalities, showing no identity or individuality. Non-existent character development rendered the cast stale and disconnected from start to finish. Attempting to empathize with any of these characters would be difficult, considering that there’s no backstory, nor distinctive attributes. It's hard to be interested in Noa's dying grandmother when she's shown for an entire five minutes, but left no permanent impact. She's dying, yet there’s no sense of consequence if Noa fails to find a cure. The fact that I lost sight of why Noa and Luke went on this journey, to begin with, demonstrates how no emotion conveys through this title at all. The story felt inferior to already poor gameplay, typos, and a contrived, linear plot that went no where — besides off a cliff. The dreadfully dull plot significantly constrained overall enjoyment. Further, they made the decision to end on a poorly thought-out cliffhanger that surely plunges In Vitra into obscurity. The gameplay emphasizes a top-down view, focusing the camera above the player and world, allowing for easier exploration. Exploring your surroundings leads to discovering treasure chests and several side quests, rewarding you with DUC (currency) and Experience. These side quests involve the typical fetch-quest you have in all RPGs, such as collecting hides or find a missing person. These ended up being more appealing to deal with than the main quest line. While searching, you can additionally run into wardrobes, pots, and barrels around the environment, and opening these can award you with various items, like Armor or DUC. Staying at inns or sleeping at your house restores your health and magic power, which you'll most likely carry out every time you pass into a different village. Wandering around outside towns lead to random encounters with the typical fantasy tropes, like orcs, goblins, and skeletons. 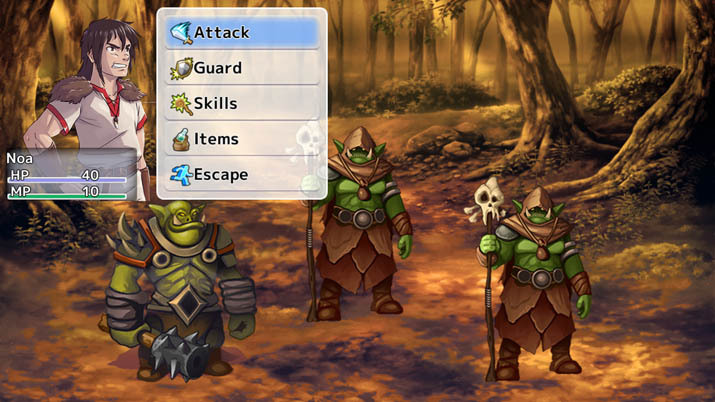 These conflicts involve the turn-based battle system, and, as the title implies, you take turns attacking or casting skills on your adversaries. Defeating these enemies lead to Experience and specific items. As you gain Experience, you level up, which enhances your stats, and reaching certain levels automatically gives you other Skills. These Skills vary for every character: some learning spells, others learning debuffs, etc. It's difficult to say whether each character possesses a class; they all appear to be similar with the exception of different skills. Generally, the mechanics are not distinct from what has been achieved in other JRPGS, such as Final Fantasy, Dragon Quest, and Shin Megami Tensei, and within that set each title set itself apart with features such as summons, personas, unique magic systems, etc. Pushing for this traditional method without innovating is a recipe for disaster. It’s been thirty years since Hironobu Sakaguchi created Final Fantasy; when story wasn't the standard, he made something extraordinary and defined a generation. Now, we have In Vitra, struggling to be what it's not — there's nothing in this title that produces the Japanese cultural feeling of a JRPG. No imagination, coupled with a lack of understanding of the genre, destroys the essence of what inspired In Vitra. The characters are so dull, you’ll wish you were playing Final Fantasy I-VI. Please, do yourself a service and pass on this title, especially if you already played the series mentioned above.